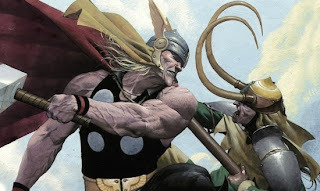 Thor & and Loki: Blood Brothers is a motion comic translated from a four part limited series comic that came out in 2004 written by Rob Rodi and drawn by Esad Ribic. The comic is titled Loki so you can tell that this motion comic is trying to ride off the popularity of Marvel's "Thor" film. I don't know about you but when I hear Thor I think "battle", and this is anything but. This is a tale about Loki after he has defeated Thor and become Lord of Asgard. The writing is very Shakespearean therefore quite wordy and at times confusing. Despite that though the story is really good. When it comes down to it this is about Loki, his inner struggle with all the weight of having to be the Lord of Asgard including as to whether or not to end Thor's life now that he has finally defeated him, and has him in chains. By the end of this story you will feel sympathy for Loki as they take you on a journey into Loki's past memories of him and Thor. The voice cast was pretty solid, though you won't find any big names here. The voice actors all did a great job especially the actor who voiced Loki. The only character whose voice I didn't care for was Thor. They made him sound like a big, dumb Asgardian jock which was probably done on purpose since that's the light he was kind of "drawn" in this. Why Marvel continues this motion comic crusade, (besides the fact that it's cheaper), I know not. The art is used and taken right out of the books. When they stray from that art it appears out of place and unfinished. Instead of continuing with motion comics which tend to feel just odd they should just concentrate on turning these comics into full animated films which DC has been quite successful with. Well enough about me ranting about motion comics. What is all comes down to is that Thor & Loki: Blood Brothers is boring and too wordy as a motion comic but as a comic its genius. Why I'm really trying to say is that the Thor & Loki: Blood Brothers motion comic is a PASS, but the four part Loki series is a total BUY. The issues are available to buy digitally at only 1.99 each.